Help Kids Brain Health Network by participating in our research projects, and be a part of improving life for children with neurodisabilities and their families. Attend a KBHN conference, and connect with a wide range of researchers, heath care practitioners and other stakeholders. Join us on social media, and stay informed about new research on neurodisabilities and what KBHN is doing to improve life for children and families in communities across Canada. KBHN funds critical research into the causes of and treatments for neurodisabilities in children, and aims to provide effective programs of support for their families and their communities. Some of these research projects require a range of participants, including people just like you. If we are actively looking for participants in a new upcoming research project, we will post a notice here. So watch this spot! Metformin Clinical Trial: We Need Your Help! 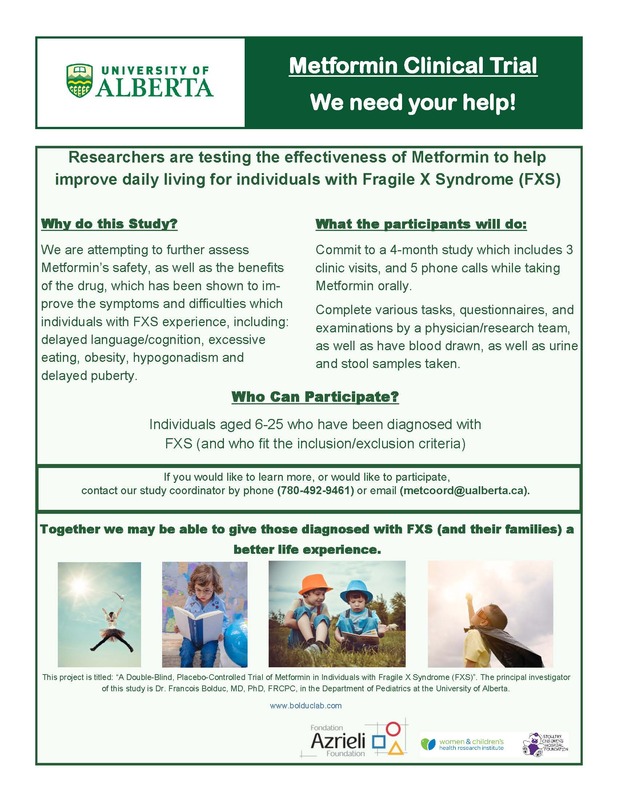 KBHN researchers at the University of Alberta are testing the effectiveness of Metformin to help improve daily living for individuals with Fragile X Syndrome (FXS). Together, we may be able to give those diagnosed with FXS and their families a better life experience. Researchers are attempting to further assess Metformin’s safety, as well as the benefits of the drug, which has been shown to improve the symptoms and difficulties which individuals with FXS experience, including: delayed language/cognition, excessive eating, obesity, hypogonadism and delayed puberty. Our Sister Network, CHILD-BRIGHT is recruiting families familiar with patient-oriented research to help create a website. Would you like to support patient-oriented research? Share your research involvement story with us, and receive a $50 gift card! “Patient-oriented research” means that parents, patients, researchers and health professionals work together to choose research topics, plan studies, share knowledge, and make changes in order to improve healthcare for children and youth. A group of researchers at BC Children’s Hospital and Sunny Hill Health Centre for Children, led by Dr. Shazhan Amed, are co-creating an interactive website with families, to make it easier for families to engage in research. We are seeking families to share their experiences with research involvement to help our team build the website. If your family participated in a health related study (especially as a research team member/partner) and you are willing to share your story to help other families understand research, you are a perfect fit! 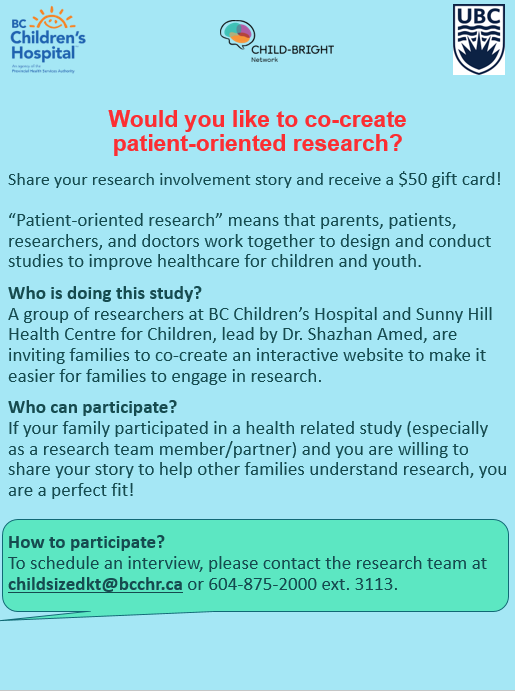 Please contact the research coordinator at childsizedkt@bcchr.ca or 604-875-2000 ext. 3113 for more information. We’re Recruiting for a Sleep Study! The Better Nights, Better Days NDD (BNBD-NDD) project is seeking participants for an intervention program for parents who have children with neurodisabilities (ADHD, ASD, FASD, CP) that experience issues falling asleep, staying asleep, and waking to early – collectively categorized as insomnia. The interactive, online program aims to help parents understand their child’s sleep problems, while providing self-administered and evidence-based behavioural strategies to help their child sleep better. The research study is open to Canadian parents of children with ADHD, ASD, FASD & CP between the ages of 4 and 10 years who experience insomnia. 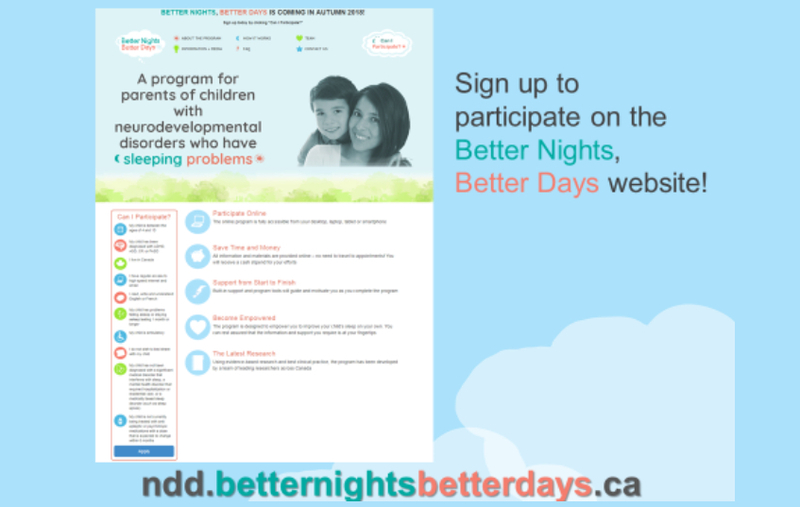 Interested parents can visit the BNBD-NDD website at ndd.betternightsbetterdays.ca for more information and to determine if they are eligible to participate. BNBD-NDD is funded by Kids Brain Health Network, a National Centre of Excellence of Canada.